How to stencil a silk skirt - Design Inspiration. Planet Stencil Library. The silk skirt has languised in my wardrobe for years and I am about to attend two occasions which may require evening wear. The skirt was always much too big and I never got around to altering it. This is a relief because I have been getting a little hefty of late and now it fits....and nothing else does. I had damaged a lettering stencil whilst cutting it for a client and as it was a custom job I felt I could not put it in the sale bin. The text is in French and describes moonlight, and birds in the trees so I felt it was an apt choice to combine with a Chinoiserie stencil of branches, birds and flowers. I stenciled the skirt with many colours so that I should always have a top and shoes to match it. I also wanted to use many of the colours from our new Lumiere range of metallic and pearlescent paints. This is how I stenciled the skirt. Firstly I sprayed a light mist of Spraymount repositioning adhesive over my work table then smoothed the largest area of skirt onto it. The Spraymount stops the fabric from moving when stencilled. The back of the stencil was also sprayed lightly and evenly then it was pressed onto the silk. The text was stencilled onto the silk using a bright gold paint. The paint was taken from the lid of the pot so that very little gets taken into the bristles of the stencil brush. Work the lightly loaded brush onto paper towel (see photo above) until the tips of the bristles carry moist paint not wet. Do this using a circular motion. Stencil brushes are flat, round and should have flexible bristles. Do not risk spoiling the project by not using the right tools. You need a separate clean,dry brush for each colour used on the project. The text from the custom stencil was applied over and under the Chinoiserie designs. As each area was stencilled I repositioned and re-smoothed the fabric onto the slightly tacky surface of the table. In the picture above I am masking areas of the design with tape. This is to prevent me stencilling into these areas. Sometimes just a small detail was needed. When finished I dressed Matilda the mannequin in it and took pictures...just incase I don't get any of me wearing it. WOW. I loved your wisteria skirt (really loved), and this one is as amazing. Doing a skirt like these two is now officially on my bucket list. You are so talented. Love the quote, can you share it with attribution. Really appreciate the creativity that constantly springs forth from your foreheads, fully clothed and ready to go. Hi Dru, The poem is by Verlaine. The stencil is sold at Country By Mail of Sweden. They have a very nice site and sell quite a few of our stencils but that one is their design so I can not sell them. I think they ship worldwide and have a translation button on the website incase your Swedish is as bad as mine. I'm so glad that you liked it..get stencilling girl and send a picture of the finished outfit. I love the way the skirt turned out with the stencils. I am going to do a class in Qatar using scarves with the stencils I brought out with me. This gives me inspriration. That's great Karen, do post the details of your class here if you would like to. well, you MUST get a picture of you in the skirt! I love the script over the designs.....and the overall design is so wonderful! It is like you are wearing vintage chinoiserie wallpaper! Fantastic!! I did get one and I'll post it. The skirt got drenched in champagne....luckily not my own. A gust of wind caught the table cloth at the garden party and tipped all the drinks on me. Thank goodness that the paint on the skirt is tough. There was no red wine on the table and I was holding my own glass when it happened! One of the coolest, prettiest things I've ever seen. I've daydreamed about doing a dress... since I saw your wisteria skirt actually...and now this one... They're both amazing, and so inspiring. Hi Vicki, I have loaned the skirt to a friend to wear tomorrow night. We are singing blue grass and old timey duets at a fund raiser. She will be wearing the Chinoiserie skirt and I will be wearing the wisteria! Will try and pursuade someone to take a picture. Hope that it does not rain. A beautiful design- is that lettering style available in your standard line? Hi Betty I am not sure if it's one of our In Your Own Words collection or not. I shall ask Rachel and come back to you with an answer. Just fabulous...and elegant. I'm just now getting interested in stenciling so this would be down the road....where do I get a collective collection of how to start and where to buy the products to get started? I'm reading your post and love all your work....love...love....love! Thank you Regina, stencilling fabric is really easy as long as you prevent the fabric from wriggling about. We use a light misting of Spraymount on our work table and smooth the fabric onto it. To get started I would recommend 3 or 4 brushes of differing size. A can of Spraymount and three paint colours plus a gold. We can ship everything worldwide except Spraymount, that is UK post only. However it is for sale in many countries. 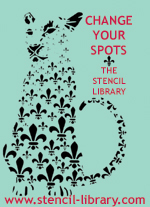 If you look at the accessories section of www.stencil-library.com you will find all our paints and brushes. Our stencils are shown in the catalogue section.